We do not know exactly when the Percheron first came to England; it could be as far back as the days of William the Conqueror who brought horses into England when he left is birthplace of Normandy in 1066 for the invasion of England. It is reported that many thousands of horses showing strong signs of Percheron blood were imported to Britain from North America during the latter half of the 19th Century for omnibuses and other light draught work in the big towns. The formation of the British Percheron Horse Society took place in 1918. Stallions numbering 36 and mares 321 were imported from France during 1918-1922. These, together with stock imported from America and Canada formed the basis of the first Stud Book. The merits of this clean-legged animal were unmistakably recognised, and membership of the society grew steadily. The main aim of the Society was to encourage the breeding of a clean legged draught horse which were powerful, active and quick in work with a good temper and easy to handle. The British Percheron Horse Society decided immediately on its formation that it would not accept any imported animals for entry in its stud book except those that satisfied representatives of the Council of the Society that they were up to a high standard of excellence, and also passed a veterinary surgeon, appointed by the Council, and free from hereditary disease. It also decided that no imported animals could be eligible for the British book unless already entered in the Stud Book of the country from which it had been exported. The British Percheron Horse Society is not connected to any other Percheron Breed Society, it stands alone and has always set its own ‘breed standard’. Imported animals are identified separately in the Society’s Stud Books. Today, the Society continues to make progress in its breeding programme such as the introduction of parentage verification using DNA for pure-bred registrations. The work of the Society and dedication of breeders has ensured a good standard of breed in the British Percheron which is evidenced by its popularity and success. The British Percheron is successful in the show ring and has won the coveted prize ‘Supreme In-hand Horse or Pony’ at the Royal show, four times in five years. To date, no other heavy horse, or light horse, has matched this achievement. It is also triumphant in Turnout Classes, Driving Trials, and Ploughing matches, and more recently, Ridden classes. Although mechanisation has taken over the land work from the draught horse, the British Percheron is still a favourite with a few enthusiasts who use them for farming and logging. The origins of the Percheron are not known for certain. With no accurate records, there are plenty of rumours and myths, such as it being related to the Boulonnais horse, which was used in the Roman invasion of Brittany, or that Charles Martel took captured Arabs and Barbs home to breed them to his warhorses after his victory over the Muslim Umayyad Arab Caliphate at Poitiers in 732 AD. The first known records for this breed do show that from the 8th Century onward, the Percheron came from an area called Le Perche, which is a district of Normandy, France. The Percheron would have altered in appearance since the 8th Century and they have since been dispersed around the world with several Percheron breed Societies being formed, producing their own studbooks. Slight differences in appearance can be found between the French, the North America and British Percheron, hence today’s reference to the three types. In general, the height of the British Percheron is between that of the French and the North American. Despite all the changes in breeding over the centuries, the Percheron remains one of the favourite heavy horse breeds. There are still the two types, the heavy draft and the lighter draft. The horse is known for being amenable, energetic and elegant, hence its popularity today. 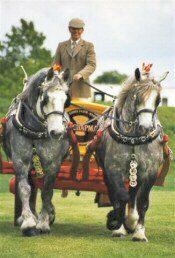 During the latter half of the 19th Century many thousands of horses showing strong signs of Percheron blood were imported into Great Britain from North America for omnibuses and for other light draught work in the big towns. It was shown in evidence before a Royal Commission on horse breeding, which sat on the completion of the South African War that ninety per cent of the London bus horses were brought over in America or at Liverpool on landing from that country. These horses were undoubtedly the produce of Percheron sires mated with the United States farmers’ working mares. Many of them were purchased from the ombibus companies to horse the artillery for the South African war, and proved the greatest success. In 1914, on the outbreak of war, Major-General Sir William Birkbeck, the Director of Remounts, sent a Remount Purchasing Commission to Canada and the United States of America which included many of the best known judges in Great Britain. These gentlemen very quickly discovered during their operations of buying hundreds of horses every week that by far the most suitable horse obtainable for draught work was showing strong Percheron characteristics. It possessed better balance, greater activity, was rounder ribbed, and showed more signs of a hardy constitution than any other type of equal weight. They also noticed how dominant the Percheron stallion seemed to be when mated with the nondescript mares of the country, and how uniform to one type the resulting stock came. Horses of Percheron type also proved to be wonderfully good tempered, and withstood the nerve wrack and hardships of the long journeys by rail and sea better than others. The experience gained of them in the remount Depots in England and France, and in the Armies themselves, proved that the only rival of the Percheron type of horse was the clean-legged draught horse from Ireland and Wales. And these were only obtainable in the comparatively very small numbers. The opposite viewpoint of the above from the other side of the Atlantic is written in the book entitled ‘A history of the Percheron Horse’ – compiled under the direction of Alvin Howard Sanders, D. AGR., LL.D. in collaboration with Wayne Dinsmore, M.S.A. Secretary of the Percheron Society of America. “In the meantime, the Percheron type has made many friends in England. The breed, mostly represented, it is true, by ‘grade’ horses as yet, is firmly established in the hearts and minds of the responsible Officers of the British army. Go where one will in army circles, he hears nothing but praise for a horse that has proved his sterling worth in artillery. East and West, North and South the story is the same; the half-bred Percheron has filled many wants and has proved himself a gentleman of a horse as well as a willing and never failing worker. We shall have a further opportunity of stating how pleased army men are with the type, but for the moment our chief concern lies in stating the facts of the case in connection with the recent importation of 2 purebred Percheron stallions and some brood mares. and carrying a heavy rider covered in armour. multiplied stage coaches and post chaises. and turned the Percheron exclusively into a heavy draught horse. Under Louis XIV, mention is made of Italian, Barbary and Spanish stallions, and at that time Le Perche provided horses for the court and the army, as well as draught horses. Numerous chronicles of the time prove that the horse industry was active. The Royal Studs, and later those of the First Empire favours the use of stallion capable of reproducing cavalry horses, that is to say thoroughbreds. The only ones obtainable then were Arabs and Barbs. However, the latter found no more favour with breeders of draught horses than they do today, and their role was therefore limited. The result of researches in the national archives made by Messrs Alwin-Howard-Sanders and Waine Dinsmore for the “Breeder’s Gazette” lead one to suppose that the same applied to the chestnut saddle stallion Godolphin of Mecklenburg-Strelitz, and the grey Turk Gallipoli, brought to the Belleme district by the Marquis of Briges, manager of the Pin Stud. The Author du Hays, makes Gallipoli, who disappeared in 1820, the progenitor of Jean le Blanc, a stallion of legendary fame in La Perche. Born in 1823 or 1824 in the Orne, this sire has been credited with numerous pedigrees and was remarkably productive; he was exceptionally long-lived and died at the age of 32. Du Hays considered the Percheron’s grey coat to be a feature transmitted by crossing with the Arab. In 1839, Edward Harris of Moorestown, New Jersey, brought to America four head of Percherons, only one of which arrived alive and this was a mare. Mr Harris had been very much impressed with the horse of heavy draft in France, and for that reason was not to be discouraged over his first failure. He returned to France immediately and purchased two stallion and two mares. One of the stallions was named Diligence, and there are no records to show anything concerning the other stallion. Only one of the mare in this importation lived. However, regretful Mr Harris must have felt over the discouragements that beset him in these two importations, it was not all in vain. It would appear that this horse Diligence begot a lot of good horses in New Jersey. Nearly 400 foals are credited to this one early day sire. He died in 1856 at the age of nearly 20 years. Among the first animals accepted for registry in the American Stud Book were Julie, a mare foaled in 1851, and two stallions named Diligence II and Louis Philippe, all sired by this first stallion named Diligence. The first Percherons to come to American from France that left a lasting benefit and that really gave the breed its beginning in this country were the two stallions named Louis Napoleon and Normandy, better known as “Old Pleasant Valley Bill”. They came over in 1851. It is said that another colt named Gray Billy came over with these two, but we know little of what he did as a sire. We know that these afterwards famous sires came from France, but as to their ancestry we are not certain. The career of Normandy ended in 1874, when the horse had reached his twenty-fifth year. It is said that he averaged sixty foals per year for eighteen years, and that they sold as three and four year old for an average of $200. Gray Billy apparently resembled the old Normandy horse in build and colour. The history of the form lacks some of the facts that make interesting reading. However, most of his days of usefulness were spent in Pennsylvania, afterwards passing to a New Jersey man by the name of Mr Bird. Gray Billy was noted for his action, as were all of his foals. He was the other horse that came over in the same importation of Normandy. “All of these animals were descended from those sent out from France in the early days of the Colony. Louis XIV, who liked to do things in the grand way, had instructed his Minister Colbert, himself very eager to see the Colony flourish, to send here only the best animals of the Kingdom”. “Thus, on the 16th day of July, 1665, there were sent to us twenty mares and two stallions from the Royal Stables (Unfortunately eight of the mares died during the voyage). Others were sent to us in 1667, including a stallion and two mares for the Ursulines. In 1670 eleven mares and a stallion were landed in Quebec; other shipments followed”. “These horses, which remained the King’s property for three years, were distributed among the gentlemen of the country who had done most to promote colonisation and cultivation”. While, no doubt, the Percheron horse, as we know it today, descended from stock similar to that which was brought to Canada in those early days, the environment and requirements of this imported stock produced in the following years, a different type to that which grew out of the stock in France. The only authentic record of the progress made by the Percheron breed is that which has been kept by the Canadian Percheron Horse Breeders’ Association since its inception in 1907. Until that time the Percheron breed was not officially recognised, and consequently was deprived of many of the privileges enjoyed by breeders of recognised pure-bred stock. There were, however, but very few Percheron horses in the country previous to this, and it can be assumed that prior to 1907 there were not sufficient animals in the country or sufficient interest being taken in the breed to warrant organisation of it. Barnwell Brigadier and Lynside Count. This site will provide you with information on the British Percheron Horse, the history of the formation of the Society and the work that is carried on today to promote and protect the Percheron Horse.